Farm to Table. Organic. Seasonal. Local. All these buzzwords have permeated our culinary culture these days, and every time we come across a restaurant that strictly adheres to these principles, it is worth talking about. 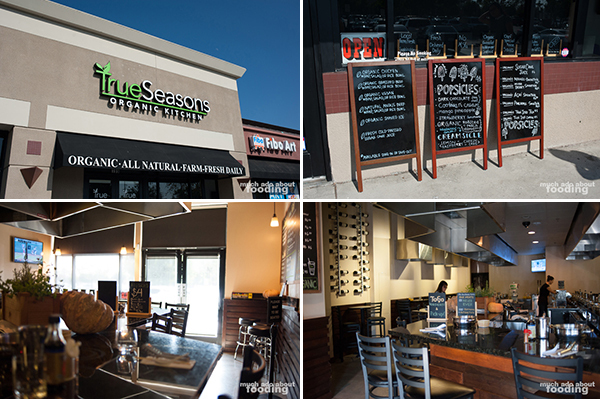 True Seasons Organic Kitchen helmed by Chef Saifon Plewtong and located in Anaheim is one of those places. Need proof? Check out their social media channels or better yet, talk to the passionate chef herself when you sit down for your meal. 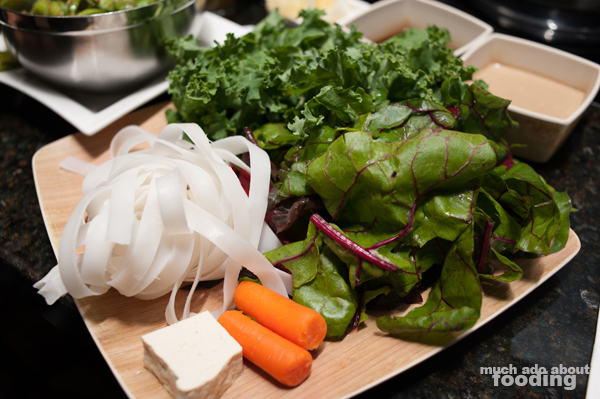 Focusing on the simple goodness of ingredients, the restaurant is an organic hot pot joint that brings in the natural beauty of proteins and produce such as organic grass-fed beef, organic chicken, wild-caught seafood, and seasonal fruits and vegetables. Opened just a year ago, True Seasons seeks not only to bring good and healthful food to its customers but also to help the community at large; in celebration of their one-year anniversary, a portion of their proceeds this month (September) will go to The Free Pantry, a local nonprofit that provides fresh, nutritional food to low-income families. We were invited in one evening to see what they were all about. Opened in 2014 by Chef Saifon and located near her son's school, True Seasons started out with a different name. 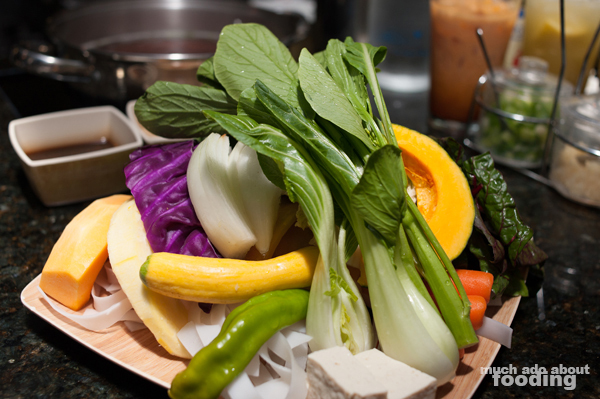 Initially called "True Shabu," it was created to support the chef's non-profit (The Free Pantry) which offers a free farmers' market twice a month to low-income families and has existed for 13 years. 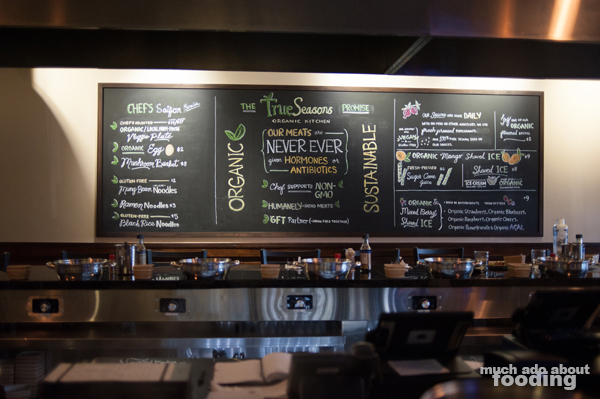 The name soon proved to not be as relevant or representative of the restaurant's true goal so it switched over to True Seasons Organic Kitchen, providing a better frame for what to expect inside. The dedication to ingredients and sourcing became quickly obvious to us as Chef Saifon described her routine of picking up all her ingredients from nearby farms daily and even visiting factories for other produced goods such as tofu. She was eager to share with us the stories and photographs of the farms where she purchases all the components that come together to make the restaurant so great. "My heart is in supporting the farmer and knowing their story. My passion is to cook healthy food for people and make it good. It doesn't matter how healthy your food is if it tastes bad too! Overall, my food is simple though with as few ingredients as possible so we can change anything if you have an allergy." 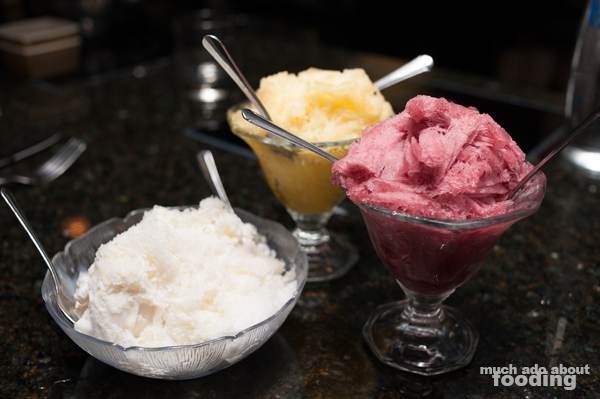 It might be helpful to know that the team's attention to detail at True Seasons makes it a perfect spot for those diners who have food sensitivities. Everything is gluten-free and even oil-free. They do not possess a stove in the kitchen so if you are thinking of grabbing something premade and hot, think again. We found it admirable just how steadfast Chef Saifon is in upholding her food beliefs, scrutinizing the origins of her ingredients and readily educating us when we asked as well. In fact, we got a small lesson in crop rotations and how they affect the food we eat when we inquired about the sourcing of our squash! Tip: eating organic squash is the safer way to go as it is traditionally a transitional crop and may absorb the undesirable components of the earth during growth. We begun with beverages and cold appetizers (remember - no stove!) 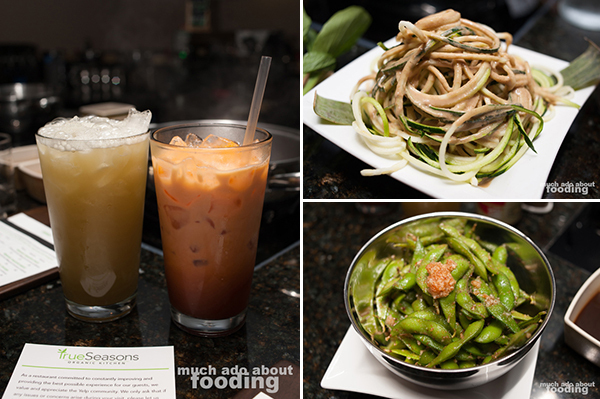 consisting of Thai Iced Tea ($5 - organic agave and milk), Organic Sugar Cane Juice ($6.50 - fresh-pressed right in front of us), Organic Zucchini Salad ($6 - sesame dressing), and Organic Spicy Edamame ($7 - truffle oil, sea salt, garlic, and chile). Both the tea and juice were very refreshing and contained just the right amount of sweetness to not induce sugary-drink guilt. I thoroughly enjoyed the zucchini spiral noodles for their crunchy texture and accompaniment by the sesame dressing while Duc was fond over the intense savoriness of the very garlicky edamame. In addition to these appetizers, the hot pot stage was set with two sauces that may not be as familiar to the frequent shabu shabu goer. Instead of traditional ponzu, True Seasons offers fresh-pressed organic pomegranate juice which had been pressed with the skin and seeds for maximum antioxidant content. There was also a sesame dipping sauce that easily became our preferred of the two. 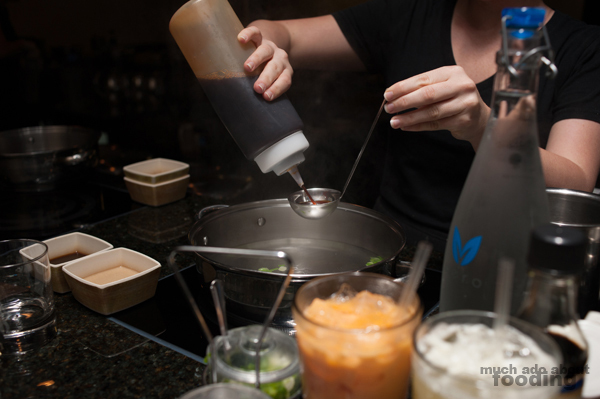 To begin, guests have the option of choosing a flavored broth or water and then picking a protein to accompany rice and a heaping plate of vegetables. Of note is that their main base is a delectable mushroom soup base but you have others options (for $2 extra) of organic miso, organic spicy miso, and organic spicy Thai lemongrass. Keen on miso? Just know that it is non-GMO and not pasteurized so can get a little salty! 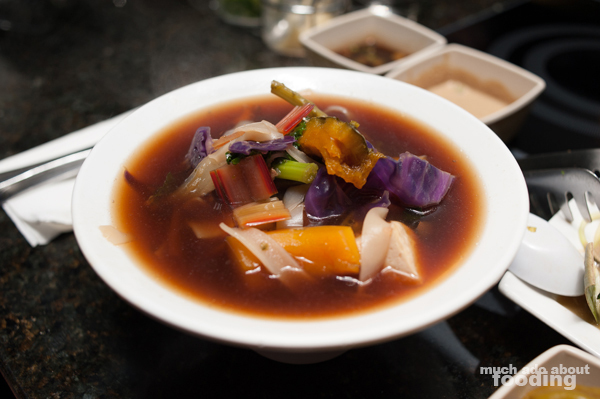 "I grew up in Thailand, and we had sukiyaki which is a form of hot pot but the base is soy sauce and sugar. I don't offer that here because we do healthy food but if people insist, I can make it - I just use gluten-free tamari and organic agave instead!" 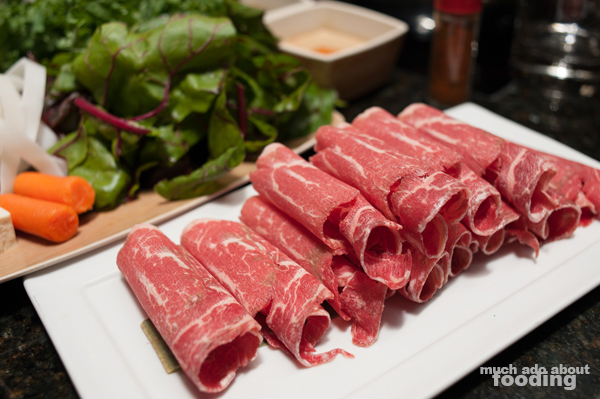 The concept of hot pot is very simple. You start with a broth which cooks in front of you at the bar, and you are presented with both a bowl of rice and a plate of vegetables and noodles. 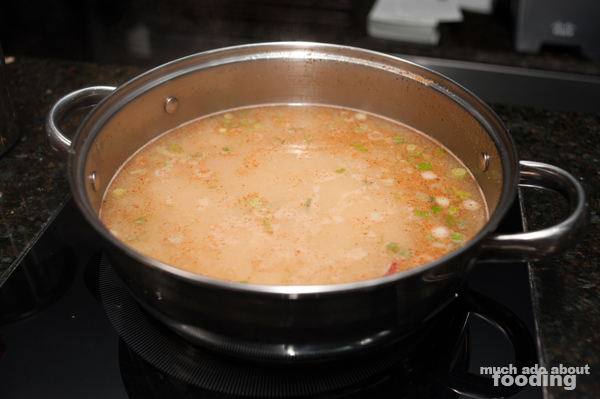 You also pick a protein to cook quickly in the broth of your choice. Ingredients are eaten with rice but some are saved at the end when the broth becomes a soup to finish off. For dinner, True Seasons offers three sizes for proteins - 9 pieces for Small, 12 pieces for Medium, and 16 pieces for Large. We opted for their most popular selection: Organic Grassfed Ribeye ($31/$34/$43) which was very flavorful and soft. We also wanted to try out Chef Saifon's Organic Vegetarian option ($17) which was a wealth of fresh, seasonal produce. On my plate that evening was a generous assortment of savoy cabbage, heirloom tomato, bok choy, Anaheim chili, squash, red cabbage, swiss chard, kale, napa cabbage, kabocha, and butternut squash. It was certainly plentiful and a viable option for those wanting to go meatless for a meal without feeling jilted in quantity. 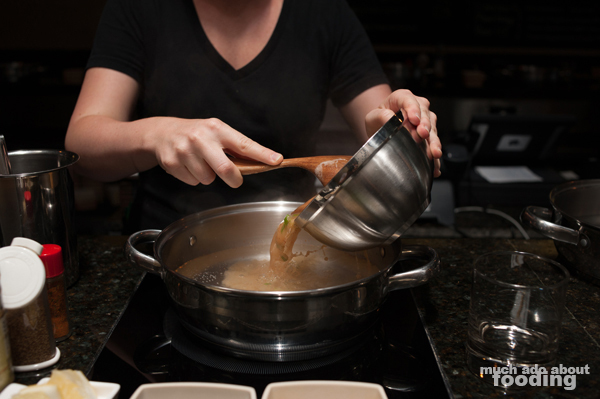 We thoroughly enjoyed the freshness of everything and how much flavorful impact there was in the ingredients themselves; they easily stood their ground, and it was apparent why hot pot would be a good choice of cuisine to showcase the food's natural goodness. To end, we experienced a barrage of their desserts - Organic Mango Shaved Ice ($9), Organic Mixed Berry Shaved Ice ($9 - organic strawberry, blueberry, raspberry, cherry, pomegranate, and acai), and Coconut Ice Cream Shaved Ice ($8 - with organic condensed milk) - all light and bright but still memorable. We especially enjoyed the coconut ice cream and the bits of fresh coconut in the dish itself. If you're interested in visiting True Seasons, they are located at 5675 E. La Palma Ave in Anaheim and are considering Newport Beach for a second location. If that's closer for you, you should drop by the Anaheim spot first to taste and fall in love with Chef Saifon's dishes!